You should probably grab a cup of tea ... this is going to be a long post! This month Meeta from What’s For Lunch, Honey? and Tony Tahhan challenged us to make Pierre Hermé’s éclairs. My first thought ... yum! However, my first Daring Bakers Challenge was an almost complete disaster as I didn't get a single edible eclair from the recipe. First of all I knew I was going to have oven issues. My two choices are a 30 year old electric oven with base elements that cooks unevenly and lets a lot of heat escape. Or the convection setting on our microwave (the only time we use it) which is fan forced, has limited temperature settings and tends to cook very quickly. I decided I would follow the recipe exactly, and as it stated that after a certain amount of cooking the door had to left ajar, clearly I had to use the older oven. I don't know of any microwaves that start with the door open! I prepared all 3 chocolate components first thing Saturday morning and they were a breeze. At the time I thought the quantities were excessive and I was right. I definitely should have halved (or third-ed?) the amounts. I was keen to try out my new piping bag and nozzle and carefully piped out 9 chubby lengths onto the baking tray. The mixture seemed a bit thinner than I thought it would be and some oozed out the end as I filled the bag. They also spread a lot on the tray once they were piped. After 7 minutes baking as instructed, I propped the door open and continued to cook. After 20 minutes, they were puffed and slightly golden and I felt quite chuffed! It didn't last long though. As soon as I removed them I noticed the bottoms were very dark, almost burnt, and they weren't as golden on top as I had thought. They also began to sink before our eyes and within minutes were as flat as pancakes. Once they were cool I attempted to slice off the top (the whole thing was only about 1cm high so it wasn't easy!) only to discover a stodgy middle that released a disgusting scrambled eggs smell. Ewww! Not cooked! All of this is logical so I decided to incorporate the advice. This time I decided to use the convection setting and fiddle with the time and temps. I put them in for 10 minutes at 180 deg C then dropped it to 160 deg for 20 minutes. At this stage they were puffed and beautifully golden so I left them in the turned off oven for 15 minutes and then left them to cool for another 15. When I came back they were again flat as pancakes and when I sliced the top off one I found more doughy, stodgy, egginess. Aaaaaah!!!!!! In a fit of temper I threw them back in the oven at 180 for a further 15 minutes not really caring what would happen. Yet again, when cooled and sliced, they were still eggy and uncooked. By this stage it was nearly 5 pm and I was totally over it. I also had 3 separate containers filled with chocolate glaze, chocolate sauce and chocolate pastry cream and nothing to do with it. What was annoying me more was having to throw all of those eclairs in the bin. Such a waste of ingredients! Having now almost run out of eggs I hunted online for another recipe. I decided this was a better option than trying to doctor the original recipe which I have never been able to do very well. This time ... success! Place water and butter in a saucepan over medium heat. Cook, stirring, for 3-4 minutes or until butter melts and mixture just comes to the boil. Add all the flour to the butter mixture at once and use a wooden spoon to beat until well combined. Place over low heat and cook, stirring, for 1-2 minutes or until the mixture forms a ball and begins to come away from the side of the saucepan. Set aside for 5 minutes to cool slightly. Whisk 1 egg in a small bowl and set aside. 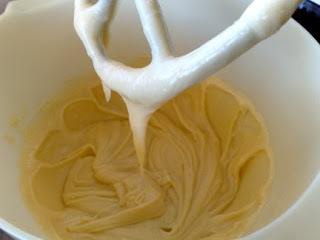 Whisk the remaining egg in a small bowl, then add it to the flour mixture, beating well with a wooden spoon. Gradually add a little of the reserved egg and beat until the mixture just falls from the spoon but still holds its shape. Preheat oven to 200°C. Brush a baking tray with oil to lightly grease. Spoon 25-30 teaspoonsful of the mixture onto tray, about 3cm apart (I made 15 larger ones). Alternatively, use a pastry bag fitted with a 1.5cm-diameter plain piping nozzle to pipe the profiteroles onto the baking tray. Brush the tops with a little of the remaining egg. Bake in preheated oven for 25 minutes or until the profiteroles are puffed and golden. The results of the 2 recipes could not be more different. This time around the mixture was a lot thicker and didn't ooze out of the piping bag. They were puffed, golden brown and dry to the touch. They also felt as light as air when cooked, whereas the others were heavy and solid. Having said all that there are about a thousand other Daring Bakers and from reading the forums it seems this recipe worked brilliantly for 90% of them, so make sure you check out their results! Overall this was a major challenge. But that's why I joined the Daring Bakers ... to stretch myself, try new things and not ignore recipes that look too hard. 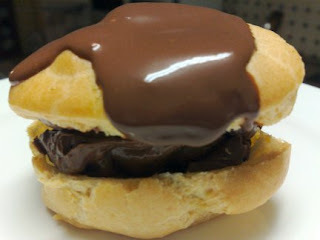 The fact is I can now add choux pastry to my repertoire, even if it is not Pierre Hermé’s éclairs. Bring on September! this was not my favorite choux recipe either, and i wouldn't make it again...i think it has too much egg in it, and mine took longer than 20 minutes to be set. that's disappointing, but glad you did find a good recipe and were able to enjoy great puffs with that glaze and pastry cream!! Welcome to DBs! 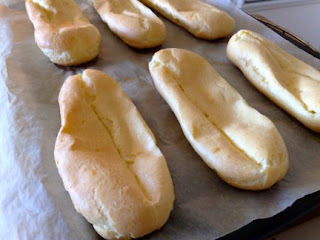 As more people post their eclairs, you'll see how many had to make multiple batches or used tricks learned from other recipes. Awesome job once you found a recipe that worked for you - I thought this one was fussier than some others I've tried, so I completely understand. Some of mine sucked in on themselves after baking too! It all worked out in the end though, right? Wow, you sure are practiced now aren't you? In true DB spirit. So, so glad you found one that worked. I'd have been sad too if you had thrown out all that stuff! Good for you for persevering! I'm another of the 10% who it didn't work out so well for and, after one time through, I was SO done. :) Glad you finally found success! Way to keep at it! Great job! Congrats on completing your first DB Challenge. It sure sounded like a challenge. I, too, was frustrated with the choux recipe and tried different variation throughout the month. I had trouble with collapsing dough too! I thought it was the humidity! Yours turned out great! Welcome to the DBs! 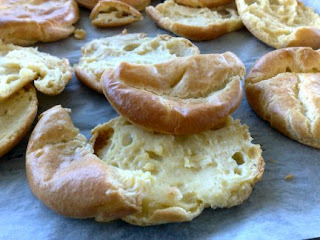 sorry the choux didn't work out for you- you're not the only one who had trouble. The end result looks awesome, though. 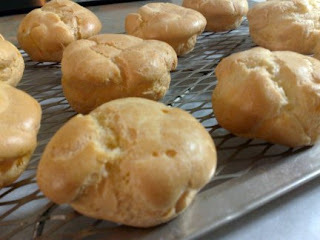 I'm glad you found a choux recipe that worked for you! That last photo certainly shows success! 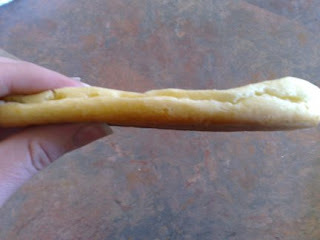 I had the same problem with my eclairs - deflated. I also did the cream puff style and they worked much better. Congratualtions on a successful first DB challenge. Glad to see you perservered and completed the challenge. The final eclair looks beautiful. And I'm sure your family was happy to eat up the "mistakes" :P I love eating up my "mistakes". Congrats on your first DB challenge... you truly are a daring baker.